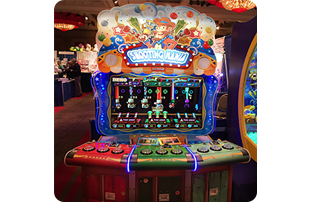 Dallas, TX, February 26, 2015 – In preparation for its March 15th US release, LAI Games displayed the hit video redemption game Shooting Mania in the Betson Distributing booth at the 2015 NJAA 20th Annual East Coast Variety Show. Betson will also have the game on display at its Myrtle Beach Spring Show on March 4th from 10am to 4pm at the Hilton Myrtle Beach Resort. For more information about the Myrtle Beach Spring Show, visit www.betson.com. Shooting Mania is carnival style shooting gallery fun! This exciting video redemption game challenges players to collect toy targets to win tickets and earn chances at the bonus round. If you fail to collect a target, your fellow players will have a better chance when it gets to them. Fun for the whole family!